Welcome to Karl's Collision Repair! 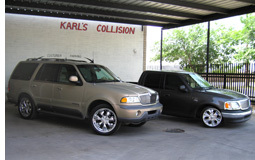 Karl's Collision is a full service paint and auto body shop located in Glendale, Arizona. We specialize in fine automobiles and SUV's, but we have the facilities and the expertise to take on any paint or collision auto repair job. Karl's Collision uses only state of the art autobody equipment and high quality BASF® paint products. We pride ourselves in delivering outstanding customer service and craftsmanship. Robert Karl , owner of Karl's Collision Repair, has over 28 years experience in the art of refinishing fine automobiles. The experienced staff of technicians at Karl's Collision Repair are all hand picked to ensure that we employ only the best of the best. We work with all insurance companies and we stand behind our reputation! If you have any questions about any of our services please feel free to contact us via our online contact form, or drop us a line at (623) 931-6092. We pride ourselves on the most outstanding customer service available. Our commitment to quality and customer satisfaction is second to none. If you are ready to have your vehicle repaired or if you are just looking for an estimate, please fill out our appointment form and we will get back to you as soon as possible.